Startup Alphabet Energy is billing its new product, announced on Tuesday, as the world’s first industrial scale thermoelectric generator, which means it is powerful enough to be used at remote oil, gas and mining sites. Called the “E1,” the device uses the latest in material science and nanotechnology to capture waste heat from the exhaust stack of a diesel generator, and the material inside converts that heat into usable electricity. When installed at a generator, say, up in the Canadian tar sands and far off the grid, the device can significantly reduce the amount of diesel fuel used. The company said it can produce 25 kilowatts electrical per a 1,000 kilowatt electrical engine, which would save a little over 50,000 liters of diesel fuel per engine annually. Alphabet Energy’s E1 electric generator that cuts diesel fuel use. The startup, which makes a “thermoelectric material” that is at the core of the generator, was founded in 2009 by entrepreneur Matt Scullin at Lawrence Berkeley National Laboratory. Thermoelectrics are semiconductors that can convert heat to electricity when heat induces a change in temperatures of the thermoelectric material, causing the electrons to move from the hot to the cold side. The difference in the temperatures is what causes the material to produce electricity. Thermoelectrics have been under development since the 1950s, but the problem has always been that many use rare and expensive materials. But innovations in nanotechnology and the use of new low-cost materials like silicon have enabled Alphabet Energy to produce a much more inexpensive but powerful thermoelectric material. 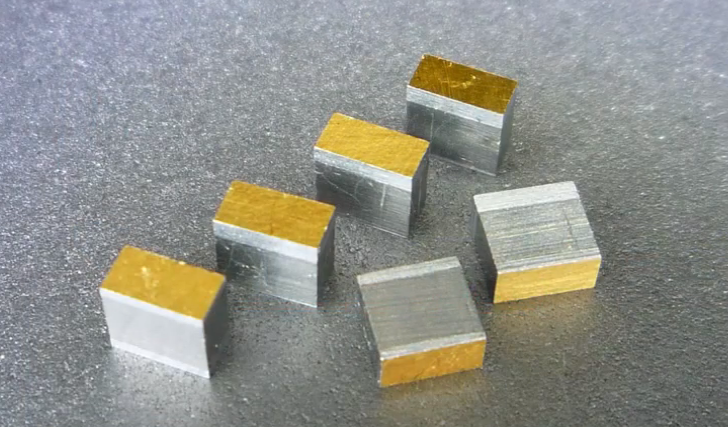 The thermoelectric material that converts heat to electricity in Alphabet Energy’s generators. The biggest issue for a startup like Alphabet Energy is that it’s a small venture-backed player and must convince huge oil, gas and mining companies to take a chance on buying a brand new product. But Alphabet Energy said it already has several customers that are testing and using the devices in the field. Canadian natural gas giant Encana is one of Alphabet Energy’s lead investors. Other investors include Claremont Creek Ventures (Oakland-based VC firm), TPG’s venture arm TPG Biotech, and CalCEF Clean Energy Angel Fund. 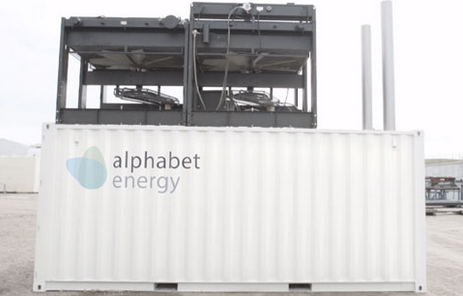 To date, Alphabet Energy has raised over $35 million in funding. Scullin thinks thermoelectric materials are hitting a tipping point and could revolutionize the energy industry. If Alphabet Energy can scale and start selling these industrial electric generators in large volume, perhaps some day those materials could really change things. And yes, we know what you’re thinking: selling energy efficiency products to the fossil fuel and mining industry isn’t without concessions when it comes to fighting climate change. But reducing diesel fuel usage does lower carbon emissions, though more importantly to oil and gas companies, it saves them money on fuel costs. However, Alphabet Energy’s materials could be used in a variety of cleaner applications some day. This huge energy market is just its entry point. I actually like thermoelectric for some specific applications, however, the liberals pushing idiotic non-proven tech constantly really makes them look ignorant, desperate and psychopathic. Most liberals have this psychosis that makes them fear harmless things like “air”, in addition to things that don”t exist like “global warming” and “ManBearPig”. I can tell you this device is not profitable at all. First of all, what is the price? Spend a million dollars to save $100k? That is stupid. How much energy was used forging that metal, shipping that container from China and gas by employees to come to work and build that. It’s a lose-lose device – buyer loses money, and the manufacturer uses more energy building it than it recovers. Also, high temp exhaust is never clean, what happens after a couple weeks when that thing is full of soot clogging every orifice? I’ll tell you, it will BREAK! Liberals have this fake imaginary world they live in where every fly by night energy startup is going to save the world… get help liberals! The efficiency figure has been obscured quite well. If they are talking about diesel engine generators, I guess 1000kW refers to their electrical output. With a typical efficiency of 38%, that means 2632kW fuel input. Then the overall heat without condensing is 1632kW, of which 25kW is 1.5%. Obviously not all of that heat is available for the thermoelectric converter and its actual efficiency probably is higher but if they want to sell this idea as a breakthrough, it would be good to actually show the numbers to understand improvement to the state of the art. This device may well be worth the money in a right applications, but deliberate obscuring of the facts makes at least me somewhat cynical. okay, but let’s just re-read this. 25 kW recovered from 1,000 kW. 2.5% overall boost. This remains at the margins, yes? If they would have one for cars it would be nice. It is time for this kind of tech to make it into cars and actually matter.